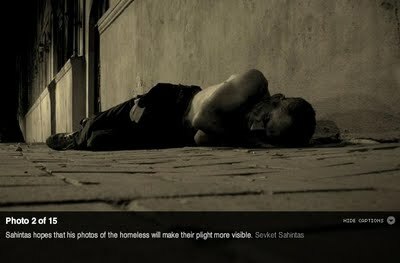 Very interesting visual essay on CNN featuring turkish cab driver Sevket Sahintas, who photographs the poor, the homeless and the lost during his night shift. Sahintas also takes black-and-white portraits of the other characters who roam Istanbul’s streets at night: dirty street children, garbage pickers, transvestite prostitutes. Despite the attention, Sahintas doesn’t make enough money from his photos to earn a living. For that, the photographer has to work the night shift in his yellow cab.